Product #16068 | SKU IXJ2 | 0.0 (no ratings yet) Thanks for your rating! The Tascam iXJ2 - Mic/Line Preamplifier for iOS Devices connects to morph your iPad, iPhone or iPod into a high-quality digital recorder. The iXJ2 records 2 channels of audio at 16-bit/44.1kHz (CD quality) resolution from one of its two unbalanced 1/8" (3.5mm) stereo mic/line inputs. Both inputs can also be used simultaneously in mono, and even summed to one mono signal from there. The free Linear PCM Recorder App, available on the iTunes App Store, provides optimized functionality. Both of the iXJ2's inputs offer independent level control and switchable plug in power. A 3-way switch chooses between the two stereo input jacks and both as left/right mono inputs. When recording left/right mono channels, the built-in analog limiter can be linked to attack/release identically on both sides. The iXJ2 has a JRC operational amplifier that provides up a 56dB gain range on each channel. 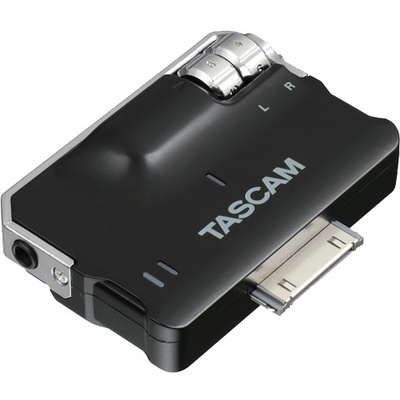 The Tascam iXJ2 weighs just over 1 ounce, adding almost no mass at all to your iOS device. It has an onboard USB Mini type B port, allowing you to charge your device during operation despite the docking connector being in use. Supports the iPhone 4S, iPhone 4, iPad, iPad 2, iPad (3rd gen) and iPod touch (4th gen). The onboard AKM AK5357 converter encodes CD quality audio at 16-bit/44.1kHz. It achieves a 100dB signal-to-noise ratio (@3V, 48kHz) and a wide dynamic range. It also features an onboard analog limiter. Even though the iXJ2 monopolizes your iOS device's docking connector, your battery doesn't have to drain. iXJ2 includes a Mini USB port that allows you to recharge while recording.